Agricultural potential depends on natural resource potentials of a country, and their wise management and use are indispensable. Endowment of natural resources (favorable land, water resources, vegetation and climate) makes Oromia the leading region in contributing to agricultural growth and economic development of the country. Agriculture is the base of food security and economic growth of the country. It is life sustaining sector, and we cannot live without agriculture, i.e., need of access to food all the time and everywhere. However, it is characterized by subsistence farming, agro-pastoral and pastoral systems having serious degradations on natural resources that resulting in low agricultural productivity and production, i.e., low productivity of agricultural lands. This phenomenon caused continuous imbalance between food supply and demand for the alarmingly booming population growth. Therefore, agriculture requires basic transformation for surplus production both for food consumption and economic growth on sustainable natural resource basis that leads to modernization of agriculture and transition to industrialization. The major persistent, complex and interrelated challenges of agriculture are population pressure and food insecurity, poverty, scarcity of cultivated lands and water resources that have resulted in subsistence life of farming/pastoral communities and improper land use systems. Generally natural resources degradation beyond tolerable levels includes deforestation (biodiversity erosion/extinction), soil erosion and compaction, decreasing soil organic matter and fertility, climate changes (drought, frost, flooding, heat wave, etc.) and consequently decreasing agricultural productivity and production and total failure of agriculture due to frequent drought. These challenges can be addressed through agricultural science and technologies that lead to increasing productivity per unit area and per unit input. 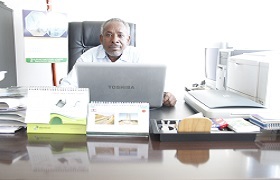 Therefore, sustainable increased agricultural productivity is achievable through integrated natural resource management technology packages which is top priority in agriculture sector of Oromia in particular and the country in general. Food security and poverty reduction are possible to manage by applying scientific knowledge and technologies in increasing sustainable productivity and production through modernization and diversification of agriculture sector that requires huge investment particularly natural resource research which has long term impacts in economic benefits and sustainability of environment. Knowledge and technology based conservation and utilization of natural resources is a must for sustainable food production to support livelihoods of societies in a nation. Out of 17 research centers under the institute, 12 centers are working on natural resource research. These include (1) Adami Tulu Agricultural Research Center (East Shewa Zone); (2) Bako Agricultural Research Center (East Wollega Zone); (3) Bore Agricultural Research Center (Guji Zone); (4) Fadis Agricultural Research Center (East Hararghe Zone); (5) Haro Sebu Agricultural Research Center (Kellam Wollega Zone); (6) Mechara Agricultural Research Center (West Hararghe Zone); (7) Sinana Agricultural Research Center (Bale Zone); (8) Yabello Pastoral and Dry-land Agriculture Research Center (Borena Zone); (9) Bedele Soil Research Center (Illubabor Zone); (10) Fitche Soil Research Center (North Shewa Zone); (11) Nekemte Soil Research Center (East Wollega Zone); and (12) Zeway Soil Research Center (East Shewa Zone). These centers are working natural resource research based on the major priority agricultural constraints in their respective agro-ecologies and farming systems in diversified agro-ecologies of Oromia. Major focus areas of natural resource research are (1) land/soil management: soil fertility improvement (nutrient calibration studies, integrated soil fertility management); management of soils with limitations (acidity, salinity, and Vertisols) and managing degraded lands (eroded, termite damaged and compacted soils) and others, integrated watershed management; and (2) forest management (agro-forestry, natural forests, non-wood forest products, and others). Natural forests are green blanket of lands serving as “lungs of the earth” in mitigation of climate change and protection of remnant natural forests and conservation of forest resources are vital for existence in relation to climate change effects particularly in Oromia where remnant natural forests are existing at present; and (3) agro-meteorology in relation to climate variability/change effects on agriculture. To undertake research on major focus areas, there are five research teams in the Directorate. Two teams are under soil management research (1) Soil Resource Survey, and (2) Soil Fertility Improvement. The other three teams under forestry research are (1) Agro-forestry, (2) Forest Improvement and Management, and (3) Non-wood Forest Product. Therefore, integrated natural resources research work efforts by the teams are to contribute toward the relative balance among increasing agricultural productivity and production, improving livelihoods of society and sustainable natural resource basis through the right integrated technology packages in the right agro-ecologies and farming/pastoral systems in watershed management approach in diversified agro-ecologies and farming systems of Oromia.